Turntable.fm has launched an iPhone app. If you’re not familiar with the service, think of it as a social concert experience where anyone can become the artist. A word of caution: this thing is seriously addictive! With Turntable.fm you can either become a virtual DJ or join rooms along with other members who listen to DJs play music. Turntable is a great way to discover new music socially, and share your musical talents with the world. 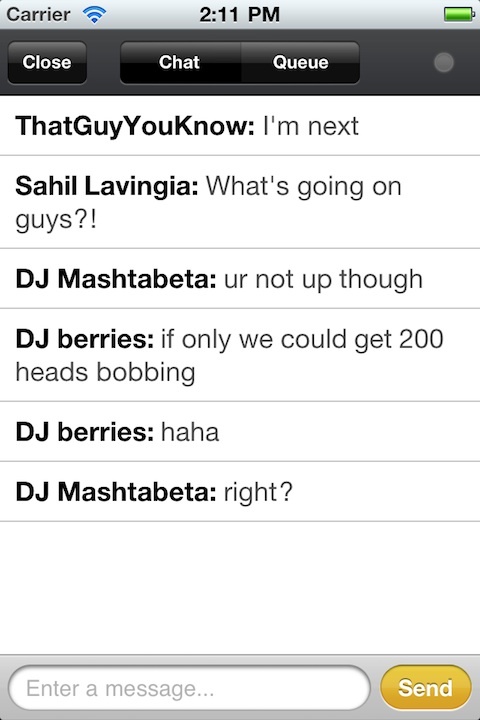 There are already a ton of DJs who are using the Turntable.fm service to grow a very large fan base. Performance in the Turntable.fm iPhone app is quite poor as of right now as there is a very noticable lag in loading a room and getting the audio started. I would think this is a sign of the popularity of the Turntable app and service which is great, but I hope the developer figure out a way to address the speed issues soon. There is no iPad version yet but hopefully something will be available soon. User login uses Facebook so it’s painless. The lobby lists a selection of rooms and you can join any room you want to get started. Rooms are created by Turntable.fm members and can contain anywhere from one to five DJs who take turns playing one song each to the audience in the room. The DJs rotate from left to right and if a DJ spot opens up you can tap to claim it. Each audience member can tag the currently playing song as either Lame or Awesome. 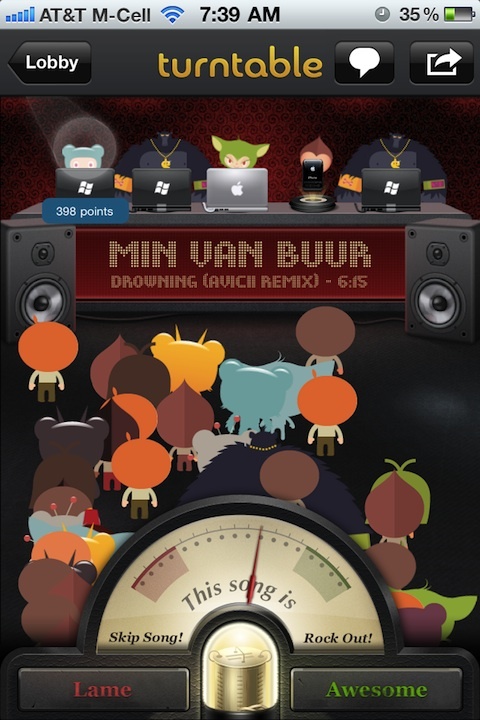 Points in the Turntable.fm system are awarded for each user who likes a song you play as a DJ. Points can be used to upgrade your DJ profile with better avatars as you build your DJ credentials. Some rooms also require users to have a minimum amount of points before they can get behind a turntable. If you like a DJ you can also fan them by tapping their avatar. The app will remind you via an email the next time your fanned DJ starts to spin in a turntable room. To play songs as a DJ you can search for songs by keyword on the Turntable site and add them to your queue. The queue is a bit hidden in the iPhone app under the chat window. When you tap the chat icon from a room, you’ll see a second tab called queue, where you can search for songs. You can upload your own mp3 tracks to play from the Turntable.fm website, although that feature is not available on the mobile app right now. DJs who want to gain offline followers, have the ability to add their Facebook, Twitter and website info to their DJ profile pages. There is also a chat system built into the app, so you can voice your opinion about the currently playing song as either the DJ or as part of the crowd. Comments show up as speech bubbles over the avatar of the members. On a similar note avatars of users who think a song is “Awesome” start to bounce on the screen to the beat. To create a new room tap the plus button on the lobby screen. The list of rooms shows the currently playing song, the room name, the number of people in the room, and the total number of DJs spinning. Using this info you can also find if any rooms have open turntable spots for a DJ. If a room gets too many people, it is deemed a “fire” hazard and you can’t enter it. You can also search for rooms by name. There is no way to jump into a random room with the turntable app, although that feature exists on the website. Once you enter a room you’ll see turntable decks with up to 5 DJs standing behind their computers. The app shows either a Mac laptop or a Windows laptop. 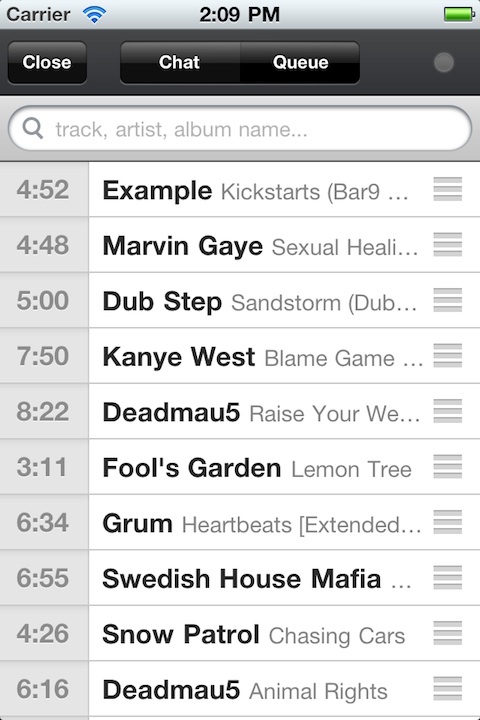 If you’re DJing from an iPhone, you’ll see an iPhone icon which is pretty funny. Other things you can’t do on the Turntable.fm iPhone app as of right now which you can on the web include: the ability to edit your user profile and customize your avatar. One of the main missing features form the Turntable service overall is the ability to bookmark or tag songs you hear. It would be really useful to be able to save track names or even maybe add songs to your favorites. Spotify integration would also be a nice to have feature. Another possible feature request would be to have a cross fade between tracks. Right now when one song ends there is a puse before the next DJs song starts to play. I would love to see more animations and avatar features addded to allow users to fully customize their gear with their favorite artists and logos. Finally, it would be nice to be able to quickly either pause streaming or mute the music on the app. Right now you have to hit the red x button on the room list to leave a room. If you close the app the music will continue to play in the background. 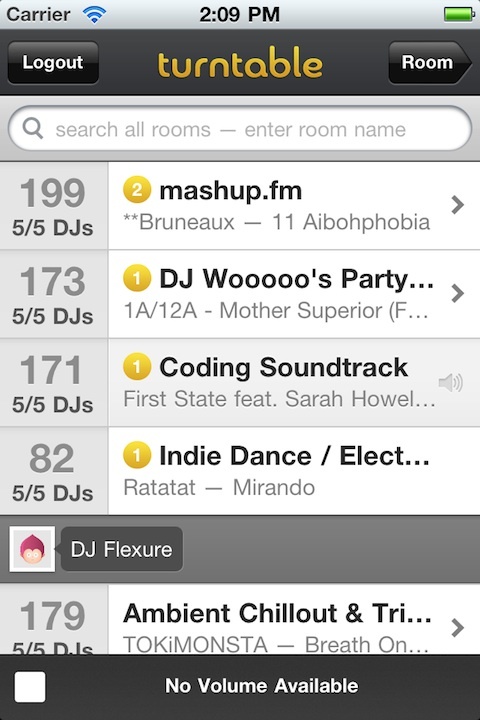 Overall, Turntable.fm on the iPhone is quite similar to what you are used to seeing on the turntable website visually and works the same way besides a few missing features. The lag is quite high right now, and much more of an issuse while on 3G although it is also problematic over WiFi. If this lag issue is fixed, the app could easily get a 5 star rating. AppSafari review of Turntable.fm was written by Joe Seifi on September 15th, 2011 and categorized under App Store, Featured, Free, Music, Social. Page viewed 4325 times, 1 so far today. Need help on using these apps? Please read the Help Page.